For some animals, finding a new home takes an unusually long time. Age, color, breed, type, or even a minor medical issue can cause uncertainty in the mind of a potential adopter. And in some cases, an animal's true personality isn't apparent in the shelter environment. But these animals have the potential to make wonderful pets - if only they had the chance to prove themselves. Adopt one of these great animals on a trial basis and if it's not a match made in heaven, you can return the animal in two weeks for a full refund of your adoption fee. For more information call 630-323-5630. To encourage the adoption of the wonderful, mature dogs and cats HHS has available, we have reduced the adoption fee for all dogs over 8 years and all felines over 1 year to $50. In an effort to keep adult dogs one year of age or older together that have previously lived in the same home, their regular adoption fee will be reduced, if adopted together. 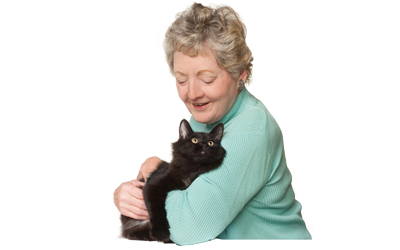 If you are a senior citizen age 65 or older, you receive a $25 discount on all pets that are 3+ years old; however, your adoption fee is waived if the pet you wish to adopt is 6 years or older as part of our Friends for Life Program. The Hinsdale Humane Society's "Friends for Life" Program invites and encourages pet owners to discover the joys and benefits of older animals. The program matches senior citizens with wonderful, adoptable older animals who make devoted companions for life! To qualify, the potential adopters must be 65 years or older, choose an animal 6 years or older and participate in the shelter's usual screening process. If a suitable match is found, the adoption fee will be waived and any spay/neuter surgery will be paid for by the Hinsdale Humane Society. Older pets have great manners, mature personalities and quieter habits. Older pets are very loving, affectionate and devoted companions. Older pets are usually housebroken and less likely to chew, scratch and damage possessions. Older pets are focused to learn and most often, know basic commands. To see which of our current animals are candidates for the Friends for Life program, see our Animals for Adoption. For more information, please stop by the shelter during business hours, phone 630-323-5630 or email info@hinsdalehumanesociety.org.